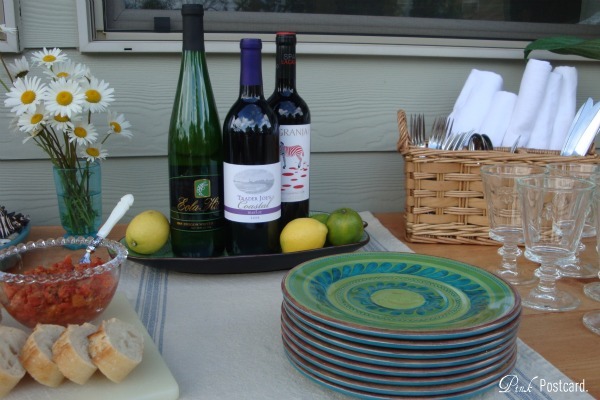 I keep thinking of this phrase with our new outdoor table! My daughter was out riding her bike one afternoon, and came over to tell me that there was a new bit of trash in the field. Oh great, I thought. Sure enough, a metal frame someone had tossed out. I was irritated. Then, later that evening an idea struck, and I ran back out to retrieve it! 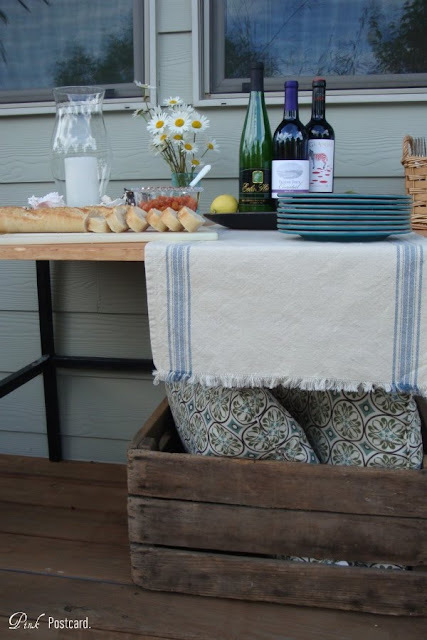 An outdoor industrial style table! 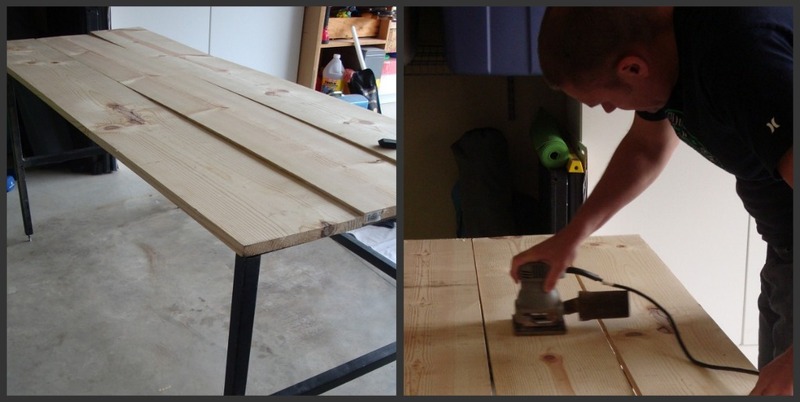 We went to work on it- some knotty pine, cut to fit cleanly on top. I stained it, added a coat of sealer for exterior use, and we added some nuts and bolts to secure it to the base. And here it is in it's (almost) finished state! It had a shallow peg that went through the leg, and nothing else has fit that we've found. 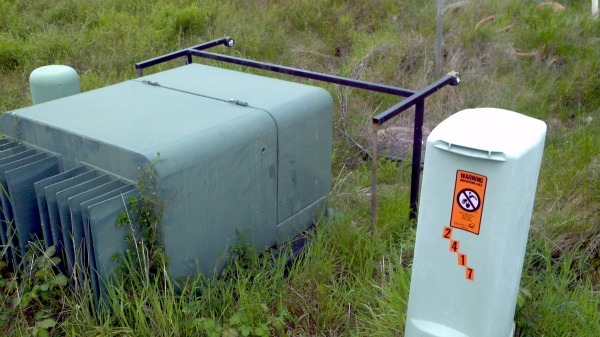 We even considered welding it, but neither of us know how to do that, and weren't even sure that would work anyway. It's still nice looking, just not the complete look I was going for. We set it up on the back deck. I plan on using it primarily for a bar / serving area. The fields all around our house are filled with purple flowers (weeds really, but still, pretty in masses) and these happy daisies. 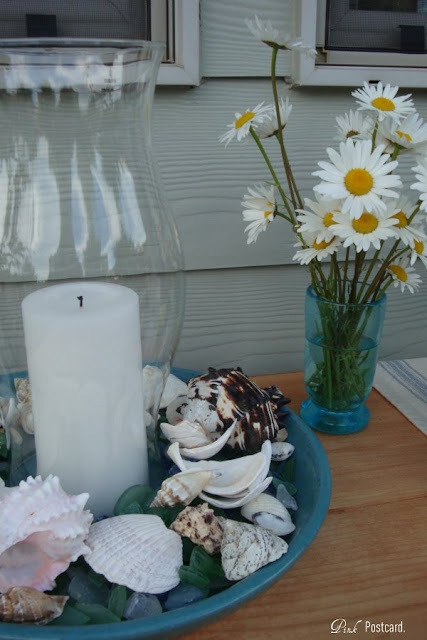 The candle holder is a ceramic pot base, filled with sea glass and some shells. I topped it with a hurricane glass and candle. The runner is some striped toweling I picked up from the fabric store. The sides were already hemmed, and after washing it, the edges frayed. I like the fringe look it added! The crate is one of several I have- all from Jon's dad. He was a farmer, and these crates were from his barns. I used them here for additional outdoor storage. Here's a bigger view of the space with our new table. We're still working on this area, but it is really coming together nicely. We've already enjoyed several warm evenings out here. The cool thing about this table is that it's low enough to flip around and use as a dining table! Multi use! I mentioned before that we were wanting some privacy for the deck. We'd planned to get some bamboo to act as a screen, planted in pots. A couple days ago, my husband was getting ready to go look / purchase some. Would you believe that he got a phone call from a coworker who just happened to be clearing out some bamboo from his yard??!! Finally, I added an area rug to the seating area. We used some seagrass beach mats- another freebie from my sister in law's moving / get rid of stuff- stuff. These are hemmed in a turquoise cotton. I think it looks great, but we'll have to see if this idea sticks. Literally. After using these for a couple days, we realized they are slicker than snot. So, while they look pretty, I'm not sure from a safety standpoint if it will work. What do you think? Any ideas on this? Thanks for letting me show you the progress on our deck! I'd love to hear any ideas you have on adding the wheels to the table. I'm determined there is a way!! Today I'm out scouting a huge rummage sale in my city- hopefully I'll have some treasures to share with you tomorrow! 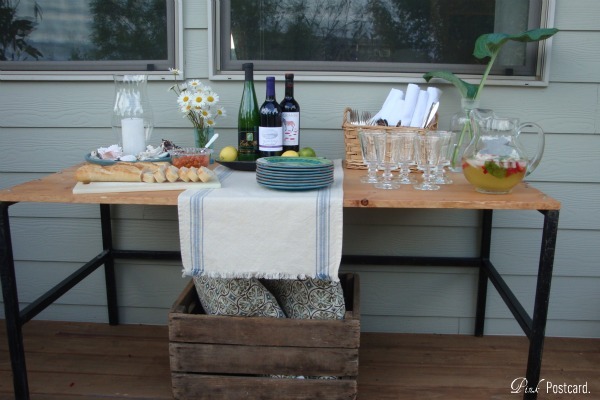 You can still link up your outdoor space at my Porch Patio and Deck linky party- it's open through Friday afternoon. Your outdoor space looks absolutely gorgeous! ...and so inviting! Now this is being resourceful! Everything looks beautiful! 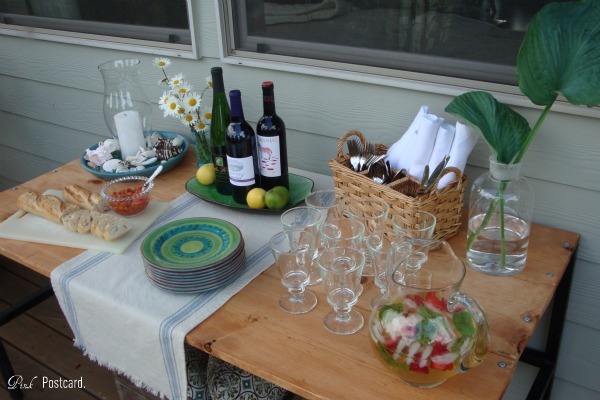 I love the table and the table setting. I am sure you will be spending alot of time out there! Oh my gosh that is one good find in a junk pile (and also very resourceful!) I love that repurposing is so in style now! Also the industrial/rustic look together - yum. Your deck looks amazing.....perfect spot for a summer margarita!! I just love your new table... looks perfect! 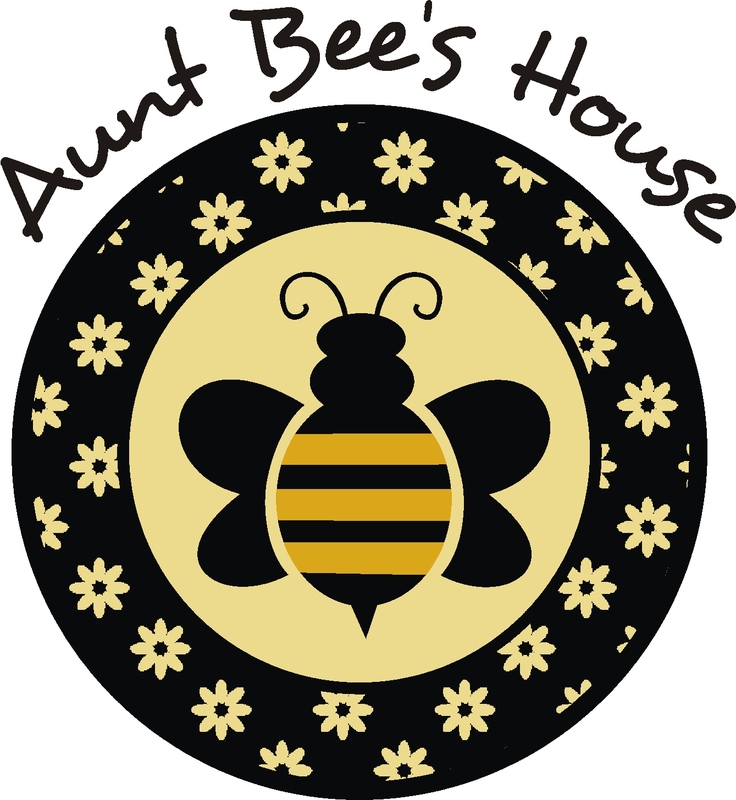 What an awesome upcycling project! Everything looks great, and I really love the box you have under the table too for your cushions. Lemonade indeed! 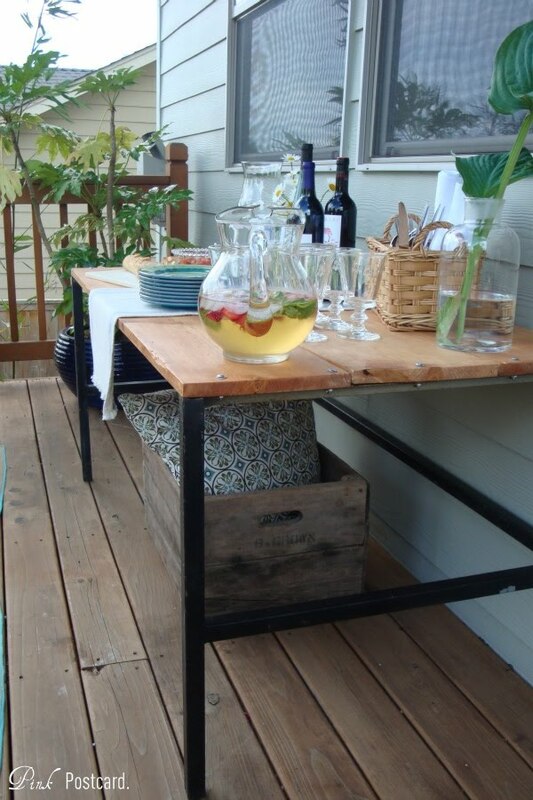 what about getting an old industrial cart base (kinda like the pb coffee table) and putting your table on that? then you would have a bottom shelf of storage too. also, my hubby grew up with bamboo in his yard....and if it's the spreading kind (which his was) it will take over EVERYTHING. there are two kinds of bamboo, and a nursery should be able to tell you which kind you have. is there some kind of spray that can be put on the grass mats to reduce slipperyness? everything looks awesome....congrats on a great backyard look. I would use a staple gun and staple them down...or you could go to walmart and get the non skid under rug stuff...staples are cheaper! LOVE the side table...and how great that the frame was literally salvaged. You are so talented. Your deck just looks fantastic! The outdoor area looks fantastic. I love the table- and all the stuff on it- gorgeous! Fabulous find, it looks like something from PB or Restoration... good job! It is really all coming together out there. How fun to enjoy the outdoors. Your table looks amazing, I especially love your glasses. Now...will you come and throw that in my backyard? lol I love it...what an amazing addition to your patio. Everything looks so warm and welcoming. Gonna have to go and get some of that toweling too...so cute. I like the fringed edge as well...especially since I am not gifted with sewing ability. I hope you are having a really great week! I love your table! You have good sense of vision to see the treasure behind the trash. hello again! I linked up. thanks for the invite! That is something I would have done!!! The best stuff is sometimes trash!!! I love your table, great job!! Wonderful job! 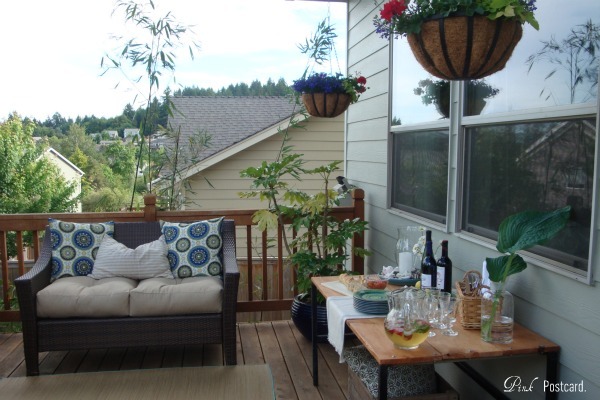 Your outdoor space is very peaceful and welcoming. I also love decorating with found objects. WOW! that is awesome!!! those tables are not cheap when bought new! Great job!!! love the styled photo shoot too!! Bring it out to the barn with some wheels and we will make it work!FYI Harbor Freight has the cheapest wheels that I have found yet. Sometimes it's actually cheaper to buy their moving dolly platforms and tear the wheels off them then to buy the wheels individually. Hmmm... I've heard of curbshopping. But I don't think I've EVER heard of a JUNK delivery! LOL... they bring their trash to you and you make perfectly good use out of it. AND! help keep the neighborhood clean. 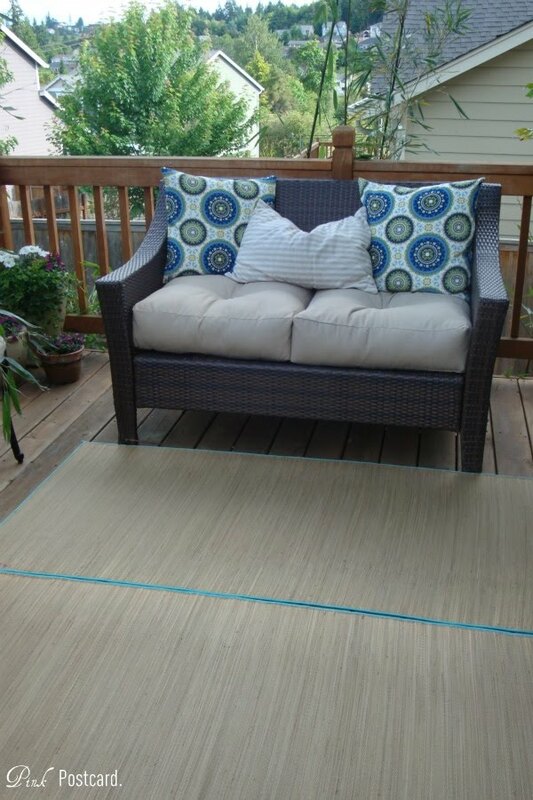 I like what you did with it and your deck and outside area looks like an extension of your home.